I was amazed to see how seriously the director Feyder and his screenwriters Françoise Rosay and Dimitri De Zoubaloff had taken the concerns and preoccupations of their child protagonists. With incredible patience and empathy, Visages d’enfants recreates the drama of conflict between children amongst themselves and figures of authority. In the film we are witness to the difficulties faced by the young son of a widowed village elder in Francophone Switzerland in accepting that his father had married another – likewise widowed – woman. The film follows the gradual culmination of a conflict between the children of this patchwork family. The adults, though generally well-meaning, are left to look on helplessly as the relations between Jean and his ‘new sister’ Arlette deteriorate, leading to dramatic consequences. Though the film ends (spoiler alert!) 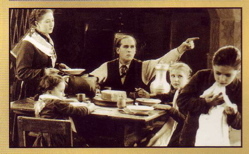 with a happy ending in the form of a reconciliation of Jean with Arlette and his stepmother, the centrepiece of the film are scenes which show the difficulty, even the impossibility, of children and adults actually understanding and communicating with each other across the generational divide. The film’s pace, use of perspective and patient storytelling very effectively conjure up a child’s view of his surroundings, distances and social relations, but also convey the deep sense of injustice experienced by a child who is required to submit to a new system of authority. How to understand children’s often violent reaction to attempts at controlling their behaviour has been a constant concern to me for several years. In my first book, Daum’s boys — schools and the Republic of Letters in early modern Germany, I tried to reconstruct the social and cultural world of a school ‘from the bottom up’. Schools in the past are fascinating since they inhabit a crossroads where the social history of populations encounters the intellectual and cultural history of the period in a more direct way than in almost any other field. I had become convinced that it is not the school as a mere institution which needs examining, but the school as a scholarly and cultural habitat. 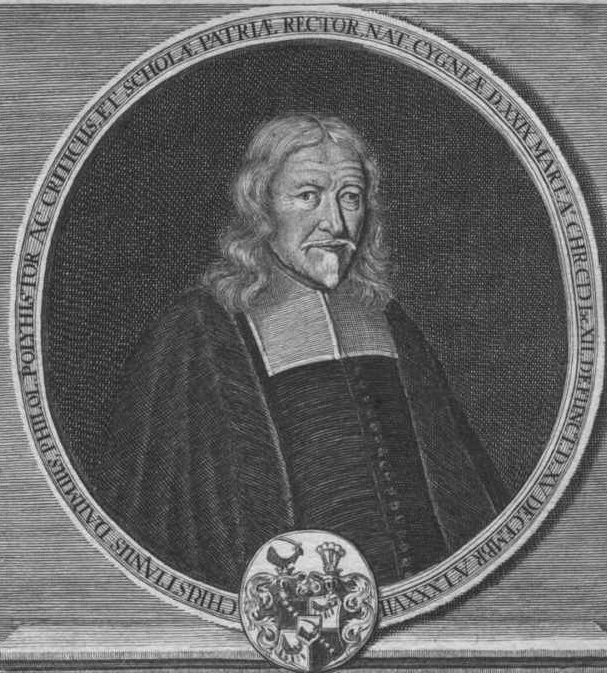 Christian Daum (1612-1687). As a scholar and teacher, he was responsible to transferring the values of learned men to the next generation. 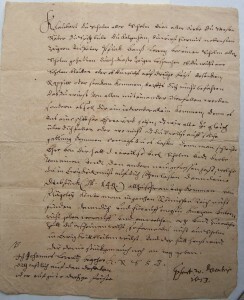 I had been fortunate in having come across the unique collection of the papers of the seventeenth-century schoolteacher and scholar Christian Daum, who spent most of his life attached to the Latin (grammar) school of his hometown Zwickau in Saxony/ East Germany. When Daum died aged 75 in 1687, he left to his hometown what is now one of the largest extant private libraries and collections of personal papers of any seventeenth-century German scholar. Of the letters Daum received during his lifetime, approximately 5300 from almost 500 correspondents have survived, as well as a similarly impressive number of drafts of letters he wrote himself. Daunting as the size of the collection was at first, my interest in working on it was kept alive by the chance encounters I made along the way with voices I had not expected to ‘hear’ in what was, essentially, a scholar’s collection of letters. In Daum’s correspondence, letters concerning scholarly matters mingle freely with paperwork and letters concerning the administration of the school. Daum did not simply keep letters from his learned associates, but likewise those he received from pupils’ parents or guardians and from other teachers. 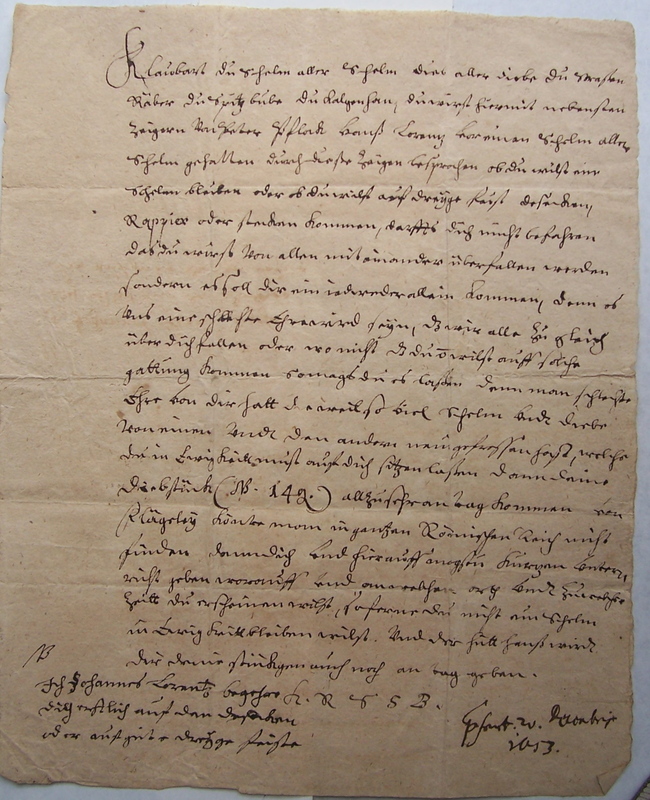 Through Daum’s papers, we get to see an early modern school the way it was seen at the time: an institution and a building, for sure, but also the home and work-space of established scholars, the rearing ground for future ones and, in its totality, the centre of scholarly activity of most small and mid-sized German towns. Latin schools were, essentially, responsible for two of the defining characteristics of scholarly culture in early modern Germany: first, how within the decentralised structure of the Holy Roman Empire of the German Nation, schools were the focal point of a whole world of scholarship outside of universities and courts. Second, how pupils became immersed at school within a culture which had its own markers of distinction, allowing scholars both to recognise each other and distinguish them from non-‘learned’ men. Letters by parents enquiring about the subjects taught ‘in class and during private lessons’ tell of the intensive prior planning that went into organising a pupil’s educational trajectory. Examining the extensive matriculation records in conjunction with the Zwickau curriculum shows to what extent pupils picked and chose from the educational offer of schools. Though school curricula were designed to provide a sensible progression from one stage of learning to the next, in practice pupils and their parents evidently compared the educational offer of a large number of institutions and approached curricula from the point of view of ‘modules’ rather than as holistic programmes that had to be followed from start to finish. From time to time, we can also glimpse directly at the effort the pupils made in making this educational effort succeed. A For instance, box of exams still exists, in which some of the pupils’ Latin writing exercises survive. One cannot help but be impressed by the level of proficiency in Latin prose and grammar attained by the age of ten or twelve at the school, regardless of the rather merciless corrections by the teachers. Yet, despite these efforts, the transition that transformed boys into educated men that took place at early modern schools was anything but uneventful. How violent the environment of the early modern school could at times be was pointed out by Philippe Ariès in his classic Centuries of Childhood of 1960. While boys emerged from most of the sources as conscientious, if picky, consumers of what the educational market of their region had to offer, often enough the school’s archive contained tales of conflict and violence. Some of the material was actually written in the first voice of the pupils, and afford us some of the rare instances when we actually get to ‘hear’ the voices of children and youth of the past. In this letter, confiscated by a colleague of Daum’s, three boys challenge another boy to a duel in writing. Among these is a challenge to a duel issued by a group of pupils to another pupil in which theythreatened to punish him for an alleged theft. The accused was told that he ‘should not fear that we will fall upon you all at once, but each one will meet you on his own, as it would bedishonourable for us to fall upon you all at once’. The boys were evidently aware of different images of male behaviour which, in this example, became intertwined: on the one hand, they were putting their elite humanist training to use, on the other hand they were attracted to the violent culture of the duel. Regardless of the crude language, the letter shows the training in writing formal letters the boys had received at the school. Transgressive behaviour such as brawling and drinking prepared pupils for the similarly violent and hierarchical culture of early modern students. I have come to think that, though subject to disciplinary measures on the part of urban authorities, pupils’ transgression was in fact essential in perpetuating a common code of behaviour for men of learning served to stabilise rather than de-stabilise existing hierarchies in early modern society. This letter really brings home one of the central conundrums of education. Just as Michel Foucault and Pierre Bourdieu had done so in their famous studies of prisons, psychiatric hospitals and schools, I could not help but see institutions as a means of establishing a system of control over a certain part of the population. Yet, as the teachers asserted their authority over their pupils, they did so over a group with whom they shared, by and large, a common objective: the passing on of practical and behavioural knowledge to the next generation and the perpetuation of particular section in society. A negotiation was taking place between pupils’ ambition and an eagerness to learn on the one hand with the urge to assert values which are often poorly understood by adults on the other. It is this process of negotiation which I found was so convincingly portrayed in Visages d’enfants. Jean’s vicious reaction in Feyder’s film to his new circumstances and the household regimen imposed by his adoptive mother reminded me vividly of the constant struggle authority figures faced in early modern Europe in controlling the often violent behaviour of children and youth. In both instances, I found that the children’s perspective, though largely elusive, was impossible to ignore. Alan S. Ross is Postdoctoral Fellow in Early Modern History at Humboldt University, Berlin. His article on ‘Learning by wrong-doing: aspiration and transgression among German pupils after the Thirty Years’ War’ can be found in Social History 40, 2 (2015), 230-246. A. Ross, Daum’s boys: Schools and the Republic of Letters in early modern Germany (Manchester, 2015). P. Ariès, Centuries of Childhood (New York, 1962 [French edition Paris, 1960]), 315-28. A. Ross, ‘Learning by wrong-doing: aspiration and transgression among German pupils after the Thirty Years’ War’, Social History 40, 2 (2015), 240-242.